How the world fusion music group Ancient Future is related to the Grateful Dead? How Ancient Future came up with that name? Who first coined the term world fusion music? Alex De Grassi and Darol Anger of Windham Hill fame? North Indian tabla master Zakir Hussain? How Ancient Future and Chinese zither master Zhao Hui ended up working together? Who the #1 world music group on the Internet was during the Napster trial? Where Ancient Future records their projects? What Ancient Future did for their 30th anniversary? What The Archive of Future Ancient Recordings is? What's happening to celebrate Ancient Future's 40 years of world fusion? 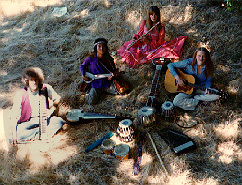 Ancient Future was formed in 1978 by students at the Ali Akbar College of Music in San Rafael, California, including Mindia Klein, Matthew Montfort, Benjy Wertheimer, and Phil Fong. Its origins, however, go back to 1967. Two of the founding members, Matthew Montfort and Benjy Wertheimer, were childhood friends in Boulder, Colorado, who dreamed of forming a band together. By his senior year of high school, Montfort was playing guitar professionally in several local bands. Meanwhile, Wertheimer had gravitated to percussion and Indian tabla drums in particular. A friend of Wertheimer's introduced Montfort to a record by the Diga Rhythm Band, which featured North Indian tabla master Zakir Hussain and his students along with Grateful Dead drummer Mickey Hart and guitarist Jerry Garcia. Montfort was fascinated by Indian rhythms, and decided to integrate them into his jazz/rock/classical fusion music. In the summer of 1977 Wertheimer and Montfort came to San Rafael to study North Indian classical music at the Ali Akbar College of Music. There they met the members of the Diga Rhythm Band, moved into the house that the group rehearsed in, and formed an offshoot called Greenhouse Intergalactic, which included Diga Rhythm Band members Tor Dietrichson (who later signed with Global Pacific Records), Jim Loveless, Ray Spiegel, and Arshad Syed (who joined Ancient Future's touring lineup in 1993). Greenhouse Intergalactic rehearsed at the Grateful Dead studio and performed a number of concerts before splitting up into two groups: a Latin band called Sun Orchestra, and the world fusion music group Ancient Future. The first lineup of Ancient Future included Mindia Klein on flute; Phil Fong on sarod, guitar, and zither; Benjy Wertheimer on tabla and esraj; and Matthew Montfort on guitar and sitar. None of these musicians were ever really quite Deadheads. But if the Diga Rhythm band hadn't been created by Zakir Hussain, Mickey Hart, and company, Ancient Future may never have formed. Besides, we have to have some names of famous 60's pop icons to drop, don't we? OK, so maybe this is getting a little ridiculous. But there is no excuse for boring Ancient Future history! Many have asked how the name Ancient Future was selected, perhaps expecting a mystical answer incorporating quantum physics and Eastern philosophy. The truth is that during the group's "name the band" brain storming sessions, two apparently contradictory themes emerged. Sarodist Phil Fong was very interested in the legendary ancient civilizations of Atlantis and Mu, and liked to imagine what the music of Mu might have been like. Fong envisioned a band name invoking an image of the ancient civilizations where the world's great musical traditions were born. But the group also wanted its name to express a vision of hope for the future through the cross-cultural exchange of that ancient knowledge. Thus the name Ancient Future was born. Those who were expecting the quantum physics explanation should now exit Ancient Future history via this alternative gateway to the Ancient Future from another parallel universe. Time travel is a lot more fun than the truth. New fans of the world fusion music ensemble Ancient Future often mistakenly add an "s" at the end of the name. When faced with this band members reply in jest that Ancient Futures are expired stock certificates. It has even been suggested that Ancient Future go public one day and issue ancient futures (your feedback on this hair-brained scheme is welcomed at the Ancient Future guest book). Actually, in light of David Bowie's much publicized stock offering, this scheme is looking less hair-brained all the time! When Ancient Future created its own contemporary sound by combining elements of the world's ancient music traditions, no one quite knew what to call the end result. In 1978, Ancient Future coined the term world fusion music to describe a genre which blends musical ideas from many different traditions.1 Today, the expanding popularity of world music merits its own sales chart in BILLBOARD. The world fusion music movement that Ancient Future envisioned has blossomed. Some evidence of this growth can be seen on Ancient Future's World Fusion Music Link Page. 1 Stephen Hill, Guide to C.T.I.S. Music, (San Francisco: Hearts of Space Press, 1981), 36.